Camelback Place is a Camelback Corridor Phoenix luxury condominium located at 3241 East Camelback Road, Phoenix, Arizona, 85018, built in the 1970s. Amenities include: Community Pool, Gas Fireplace, 2-Car Garages, Spacious Outside Patios. 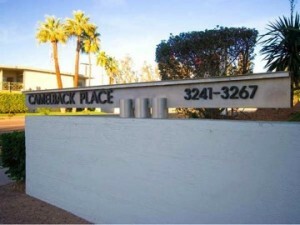 Camelback Place is located near local shopping and fine dining attractions.